Round Mountain is an open pit mining operation located in Nye County, Nevada which uses conventional open-pit mining methods and recovers gold using four independent processing operations. Gold production in the Round Mountain district dates back to 1906. A hundred years later, Round Mountain Mine reached the significant milestone of 10 million ounces poured, achieved over a 20-year period. A large tonnage open pit operation, Round Mountain has earned commendations for its safety and environmental initiatives. (Retrieved May 26, 2014, from http://kinross.com/operations/ operation-round-mountain,-usa.aspx). As part of an expansion effort at Round Mountain, a haul road (nicknamed Moose Haul Road) was needed to construct a new tailings impoundment – a dump mine where leftover materials are stored after valuable fraction has been removed. 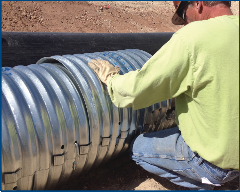 At multiple locations, the route crossed over existing steel and HDPE pipelines, which required a bridge or casing to provide a layer of protection from heavy loads and allow easy access to the pipes in case of repair or replacement. Golder Associates in Reno, Nevada was assigned the task of identifying a cost effective product that could handle a loaded CAT® 793 (approx. 860,000lbs) with minimal cover (about 3 ½’). 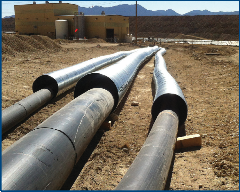 Because the pipelines are continuously flowing with pregnant or barren solution, the mine preferred not to disrupt service of the pipes during installation. In addition, a clay liner constructed beneath the pipes, which serves as secondary spill containment, was to remain intact. Contech delivered the Nestable CSP materials directly to the site where Phoenix Industrial – based out of Vancouver, Washington – assembled the casing in about five days. On average, a two-man crew could complete a 150-200’ section per day. In all, five separate runs of casing were constructed: three runs of 24-inch diameter with straight back stitches and two runs of 36-inch diameter using hook and eye bolts. The project went smoothly and onsite support was provided by Contech to offer guidance and answer questions by the owner and contractor. In short order, the crews were able to determine an effective approach to the assembly process despite not having handled this type of material in the past. After placing and compacting backfill around the nestable pipe, Phoenix Industrial turned the project back over to RMGC for final construction of the haul road (expected to be completed by June 2014). 3 runs totalling 650 LF of 24” dia. 2 runs totalling 400 LF of 36” dia.